Currently, people in the GTHA with disabilities have limited mobility options. 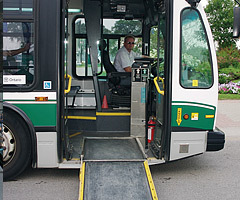 Although progress is being made, there are still too many conventional transit vehicles on the road with steps that people with some disabilities are unable to climb, and bus stops and stations that are not accessible to people in wheelchairs. For trips that cannot be accommodated on conventional transit, people with disabilities can apply to use one of several specialized transit providers in the GTHA, each of which has a geographically distinct service area. These services do not generally accommodate cross-boundary trips. Such trips typically involve transferring from one service provider to another, sometimes with substantial waits in between. The Accessibility for Ontarians with Disabilities Act (AODA), adopted by the Government of Ontario in 2005, will improve accessibility for Ontarians with disabilities by developing, implementing and enforcing accessibility standards. The process will be complete by January 1, 2025. By then, people with disabilities should be able to move from place to place within Ontario, for whatever purpose, without facing barriers that people without disabilities do not face. Metrolinx is committed to making the GTHA’s transportation systems fully accessible to people with disabilities by 2025, as required by the Accessibility for Ontarians with Disabilities Act, 2005 (AODA). Metrolinx is also committed to improving access for people with other special needs — newcomers whose first language is not English and seniors, for example. Planning for universal access is a fundamentally important part of the RTP. 8.1 Create a regional body to advise Metrolinx on matters related to universal access. establishing a GTHA taxi scrip or voucher program for areas where service is inadequate.